Huddled together in a Pyrenean mountain shelter with blue lips and clattering teeth, the four of us knew the 20km descent would be bleak. We contemplated a brew on our stoves but that was just a stalling technique – this sleet and rain was here to stay and we needed to clock those final miles to honour the efforts of all the kids at home who had committed their time to matching our miles. It was the least we could do to end on a high. Seven days ago we’d left the hustle and bustle of Bespoked. It was time to saddle up and chase the sunset on our new handmade Shand bikes. With a colour scheme that would make the Power Rangers proud we set off from Bristol to catch the ferry in Southampton. We soon realised that the ferry was two hours earlier than we thought so we had to crank up the speed and dash to the port, arriving with only 15 minutes to spare! Already the schools had started putting in the miles, trying to surpass our total and soon it became clear that this was going to be an almighty battle. Watching the schools crank up the miles was inspiring for us – it really felt like they had risen to the challenge and it gave us goose bumps knowing that so many people were taking part in this adventure just across the water from us. Arriving at St Malo the jaws of the ferry dropped at 6am and we made a beeline for the boulangarie. I’m sure Apidura didn’t envisage their feed bags stuffed with croissants but this ride would be powered by pastries and baguettes like any true trip through France should be. Skirting south around the coast, our first night was spent on a beach at La Rochelle after crossing the bridge over to Ile de Ré – a spectacular piece of engineering. Our first sunset set the bar high and we drifted off to sleep with the sound of the ocean ebbing in and out on the white sandy beach beside us. Not all culinary experiences are equal in France. Ordering a pizza from a 24-hour vending machine was a new one on me – not quite à la carte, but perfect for bikepackers. Leaving at sunrise we rode miles and miles of hot, empty, forested cycle paths, and it being out of season we saw very few other cyclists – or any people at all, in fact. Beach night two was even better than the first. 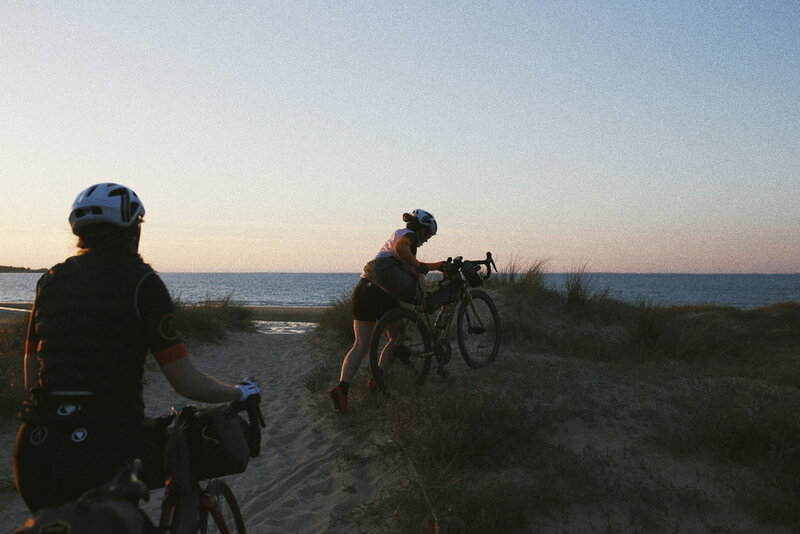 It required a 15-minute bash through a sandy woodland, bikes on shoulders, that then opened out into enormous sand dunes as we clambered skywards, the marram grass silhouetted by the sinking daylight. Bold clouds puffing up on the horizon cushioned the sun and the deep thundering sound of the Atlantic Ocean. We stood atop this huge sand dune us, looking north and south and as far as the eye could see was a pure landscape of untouched beach. Only one thing for it: full speed down the dunes towards the sea, throwing our pants to the wind and making a brave/foolish dash into the freezing waves. It was an in-and-out job, more a dip than a swim. 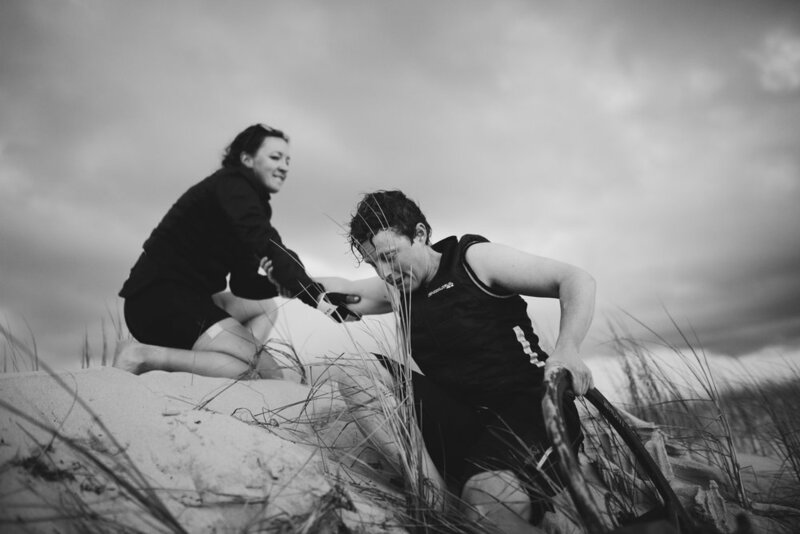 We were buzzing from the day’s ride as we cooked our soup and mashed potato, We could just take in and soak up this special place, sleeping amongst the dunes – we didn’t care that we had sand in our mugs and sleeping bags. We drifted off, warm and content, excited to see the sun rise and do it all again. And sunrise did not disappoint. After a third night deep in a beech forest we had to remove all the snails that had made their homes in amongst our kit for the night, including one on Lee’s toothbrush. Our coffee count was rising and it was time to head inland and push towards the mountains – my favourite terrain, although the weather was on the turn, which can be brutal when up high. Climbing up through a ghostly empty ski town as the season had ended was odd. Not a soul in sight, just four lonely cyclists and James the photographer, cutting through the dense fog, visibility down to ten metres. We made it to the top to find that our planned route was impassable due to snow. Limiting our time up here was crucial – it was time to dash down out of the bleakness before it got dark. Each hairpin direction was only visible by the white centre lines on the road. This was not a place to overshoot a corner – you’d plummet endlessly. Finding the one bar open halfway down the mountain, we bundled in to jovial looks from the local men and promptly ordered numerous rounds of chocolat chaud. Cupping the steaming milk jug my fingers came back to life and we pressed on off the col to find a auberge (a motel-type place) for the night. After a tip-off from the hotel we walked down to the village to find a quaint French bar that was bustling with children, dogs and a man blowing bubbles – but most importantly a plethora of local beers and potatoes in foil. Here sat five very happy cyclists for the evening. We thoroughly abused the buffet breakfast, filling our jersey pockets with packets of jam, nutella and cheese. This was day five, and our first shower and roof since we had left Bristol. Breakfast took two hours, and a bag of leftover pastries was handed to us as we ventured out into a morning of showers, a kind warm gesture to start an otherwise potentially cold wet day. Meanwhile the schools back in the UK had clocked up an astonishing number of miles. We kept checking the bar chart and got excited each time the figures rose – we simply couldn’t keep up. I’ve never been so thrilled to lose! To be part of this bigger team was brilliant. I pictured everyone biking to and from school and smashing about in the woods, rolling along canals or just razzing around the playground and I have no doubt the teachers jumped on board too. Did you know it’s warm sleeping in a cave? Neither did I. Watching the bats fly in and out to the sound of the river, knowing we’d stay dry, was reassuring – unlike looking out of the cave entrance the following morning and seeing the grey wet sky. But it was the final day and we knew that there was a bed at the end of all the climbing. Most of the day the day the rain beat down on us and bounced up from the road. We had ALL our clothes on, and we couldn’t ride too close together, because you’d just get a face full of spray from the rider in front. We resorted to singing to lift our spirits, and established that if you sing the Beegees while riding uphill, it effectively simulates altitude training. Sweeping through a tall, rocky gorge, birds circling above us, rock fall littered the road, and we decided it was wise to stay sharp and not get too distracted by the view. We climbed with vigor to warm our bones, until we reached that shelter on top of the final big climb. A sinewy 20km descent wound down the mountain ahead of us. It would be bleak, our cold fingers barely able to grasp the brakes. My knees went purple and I let out a stream of motivational self-chat on the way down: ‘think warm thoughts, warm warm warm, not cold, nope’. I think I might have frozen to the bike because when I tried to pedal my legs struggled to go round and even my eyeballs felt icy. I looked around at my friends and laughed – we all had purple lips and chattering teeth! As we dropped down the mountain the sleet eased and we thundered along the last few kilometres, arriving sodden and weather-beaten at our friends’ house (John and Clare) to the warmest of welcomes. Like true outdoor people they tossed over the keys and left us to sort ourselves out in the comfort of their home, where they had left Yorkshire tea bags and a selection of foodstuffs ready for us to inhale. We ate and drank like kings and had a well overdue wash. All in all an exceptional welcome that we very much appreciated. Having time to hang out and contemplate the journey also let us reflect on what a success the schools had managed to achieve, motivating themselves to push on and keep riding. Our journey and everyone else's journey, parallel in so many ways, just in different countries and different contexts. 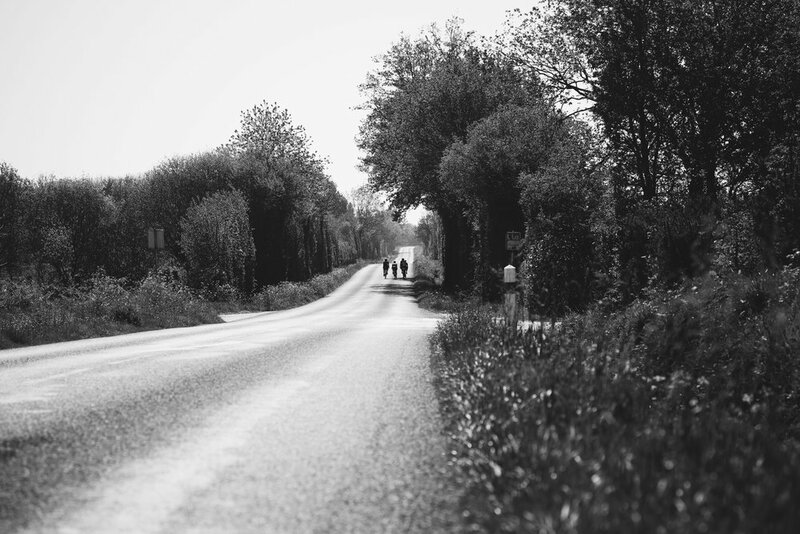 Who knows where our next journey, their next journey – or yours – will lead?